And then it seemed as though the cooing and rustling of the pigeons came right through the roof and crowded round them in a sort of dazzlement and cloud of pigeon noises. The pigeon noises came closer and closer, and garments were drawn out of the chest and put on the children . They did not know how it was done, any more than you do--but it seemed, somehow, that the pigeon noises were like hands that helped, and presently there the two children stood in clothing such as they had never worn. Elfrida had a short-waisted dress of green-sprigged cotton, with a long and skimpy skirt. Her square-toed brown shoes were gone, and her feet wore flimsy sandals. Her arms were bare, and a muslin handkerchief was folded across her chest. Edred wore very white trousers that came right up under his arms, a blue coat with brass buttons, and a sort of frilly tucker round his neck. "I say!" they both said, when the pigeon noises had taken themselves away, and they were face to face in the long, empty room. The House of Arden. Read it. ASAP. 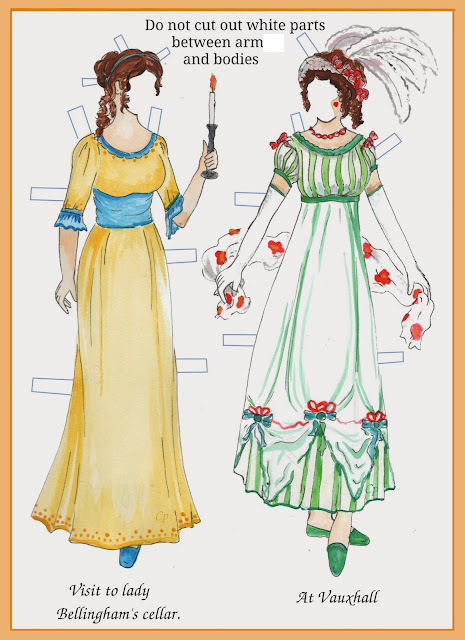 All I'm saying is: ULTIMATE E. Nesbit for Clothes in Books. So now, The House of Arden and (of course) Daniel is absolutely right: it is the perfect book for the blog. The two children Elfrida and Edred travel back in time by means of putting on the right clothes for the era, which are fully described by Nesbit. In the extract above, they are about to land in Napoleonic times, 1807. In subsequent chapters they will get themselves to 1705 (highwayman and the Old Pretender) and to Tudor times and a meeting with Anne Boleyn, and (with a sense of real jeopardy) into the 1605 Gunpowder Plot and subsequently to the Tower of London. There’s almost too much plot in this book – you feel that each of these adventures could have formed a whole book (as well as a blog entry). There is Sir Walter Raleigh, and there are smugglers, and they come to suspect that there are other people travelling back and forwards in time. “We want you to do what the spell says,” said Edred. “Make you brave and wise? That can’t be done all in a minute. That’s a long job that is” said the mole viciously. Nesbit gets a plug in for her own book The Amulet which features the similarly grumpy Psammead. 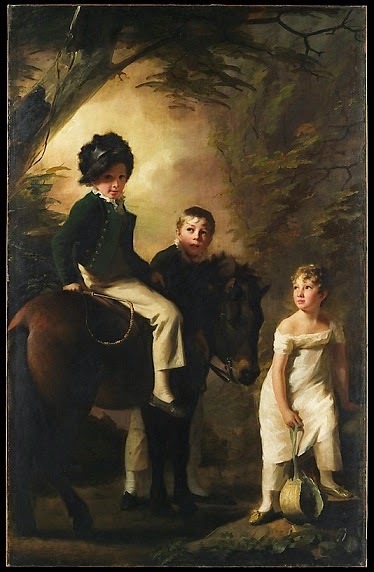 The picture above is from 1808 and is by Henry Raeburn – there are too many children in it, but it seemed just right for, particularly, Edred. From The Athenaeum website. 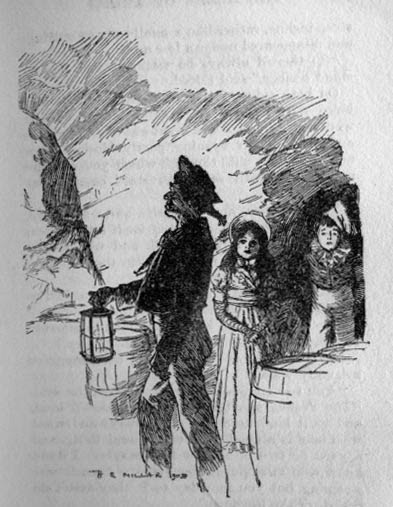 The other one is an illustration from an early edition of the book. Moira - Oh, this is indeed the perfect book for your blog! And the time-shifting plot, when it's done effectively, can be engaging. And a terrific way for Nesbit to teach a little history, too, even if that wasn't really part of the original intent. You're quite right; you had no choice but to profile this book. You are so right Margot, it is MY book! I did in fact read it as a child, and loved it then too. It sounds lovely. One of the Nesbits I've not read, but Kindle provides instant gratification! I know, and free too I hope! You can see why it isn't quite one of her best-known ones, but good fun. It is a lovely book. The last chapter or two get REALLY weird, but up until then, I genuinely adore this book and it's a strong contender for my Favourite Nesbit. I REALLY need to re-read them all, but I think The Enchanted Castle is probably my favourite. The House of Arden was one of the books that really catered to my love for vintage clothing as a kid. I never really liked this one, but loved the sequel - Harding's Luck. My book has very curious illustrations - black and white with touches of red throughout. As I remember it, everyone won at the end and had to debate among themselves how to make the most of the prize. I didn't find it "hard going" but I did find it surprisingly heavy for Streatfeild - perhaps unsurprisingly given it was supposed to be Educational. Definitely an interesting book. I was thinking I'd read this but now realizing not. I'm going to look for this one and for the Fearless Treasures as well. The general plot reminds me a little of The Green Knowe books, which I do love. I tried the Green Knowe books when I was young, but didn't take to them: I think I have to try them again - the third children's book to add to the list just from the comments on this post! I think I'll leave you to it with this one. This was my all time favourite book when I was a child and has remained so ever since. How I longed to find that chest and dress up in those clothes. I love all of E Nesbit but I think this is her best so I don't know why it's less known. There's a sequel, Harding's Luck, almost equally enjoyable. Wonderful stuff and wonderful clothes. I am of several minds about this. The time travelling in a children's story sounds intriguing, but still not sure. I suppose if I was going to give Nesbitt a try, this would be a good one? I love Five Children and It, and the Railway Children. This is one of her less well-known ones, but it did stick in my mind.... Daniel, above, says it's his favourite. But I'd probably say 5 Children and It. You can choose! Wonderful books, The Phoenix and the Carpet is my best of best, but House of Arden a close runner. The Moldiwarp, as much as anything. Very glad to find you are still enjoying the Sterne. Love the window full of corsets- it reminded me of a room full of waistcoats I saw in Venice recently. They were pure Tailor of Gloucester. I will put a photo on my twitter page so you can see what I mean. Oh yes please, would love to see the waistcoats. I have got hold of an omnibus of the Stern books, so will be starting on more of the Chronicles in the New Year - if I can hold off that long!